Start early. A kitten should learn that the cat carrier is part of the environment – a refuge, not an alien spaceship landing suddenly to kidnap him and take him to another planet. Keep the carrier open in a corner of his area, with a soft towel or blanket and a favorite toy or treat. When he is in there, try to leave him alone. You can even pretend that you can’t get him when he is in there, and let it become a safe haven that he runs to. This can be extremely helpful in case of emergency as well. Place some catnip or spray some Feliway in the carrier. You may have seen your cat rub his cheeks against objects or even your legs. He is marking his “territory” as safe and secure with his pheromones. Feliway mimics a cat’s facial pheromone, and can be used to help comfort and reassure cats while they cope with a challenging or anxiety producing situation (we have a few samples if you’d like to try it for your next appointment). Take your cat for short car rides to nowhere or take him to a friend’s house. Show him that being in a carrier and a car can be a positive experience, and doesn’t always lead to the veterinary hospital. Choose your carrier wisely. If a technician needs to pry your cat out of his safe place, it will be stressful for everyone. Carriers with both top and side doors that open easily are helpful since some cats prefer to be picked up from the top and, when the exam is over, some cats will happily run back in through a side door. 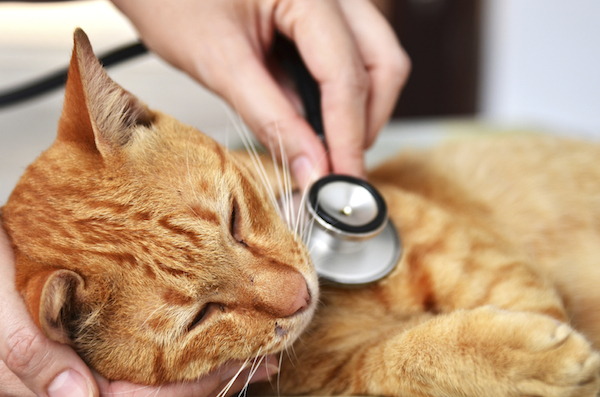 Anything that can help reduce stress will help your cat remain calmer and happier at the veterinary hospital. Cats will pick up on your emotions. Talk to your cat using a soothing, happy tone of voice. Use favorite phrases such as “good boy” or “want to go for a ride?” When you yell, your cat will react and protect himself, and if you are anxious he will believe there is a reason to be frightened. Choose your seat in the reception area wisely. If your cat never goes outside, or never sees another animal, it is probably not a good idea to introduce him to one at the hospital. Sit as far as possible away from other pets, or ask a Client Care Representative if you can wait with your cat in an exam room. You know your cat. Some cats crave attention, while others need their space to recover from new situations. Upon returning home, give him what he needs to know that everything is ok, whether that means extra affection or letting him recover with dignity. Pamper him, but continue your usual routine once home and everything will be back to normal quickly.